Simon John Pegg is an English actor, comedian, screenwriter, and producer. He co-wrote and starred in the Three Flavours Cornetto trilogy of films: Shaun of the Dead , Hot Fuzz , and The World's End . He and Nick Frost wrote and starred in the sci-fi film Paul . Pegg portrayed Benji Dunn in the Mission: Impossible film series and Montgomery Scott in Star Trek , Star Trek Into Darkness , and Star Trek Beyond , co-writing the latter. Simon John Pegg (né Beckingham; born 14 February 1970) is an English actor, comedian, screenwriter, and producer. He co-wrote and starred in the Three Flavours Cornetto trilogy of films: Shaun of the Dead (2004), Hot Fuzz (2007), and The World's End (2013). He and Nick Frost wrote and starred in the sci-fi film Paul (2011). 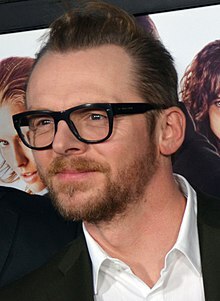 Pegg portrayed Benji Dunn in the Mission: Impossible film series and Montgomery Scott in Star Trek (2009), Star Trek Into Darkness (2013), and Star Trek Beyond (2016), co-writing the latter.